Seasoned anglers often talk about the big one that got away, but it's unlikely any of them can top the story being told by Reggie Jackson. Jackson, 37, who lives in Flin Flon, Man., was ice fishing on nearby Wildnest Lake in northern Saskatchewan Wednesday. He had just caught his limit of fish and was heading back home when he noticed another man who had taken down his shack still hadn't left. The man, named Nolan, still had all his gear — an ice saw, straps and his nearby snowmobile. At first Jackson thought he needed help. But then Nolan pointed to the creek. "Whoa! I had to do a double-take to realize what I was looking at. It was in a bit of disbelief," said Jackson. Poking out of the water was a giant head, belonging to a female moose. He said the animal appeared to be exhausted from its fruitless struggle to escape the icy water. "There she was, stuck in the water," he said. "We went from there and we worked really hard to get her out. Nolan tied a rope around her neck, lassooed her. And then we gently tried. We cut a path with the chain saw. And we got her over and got her close but she was just too heavy for us." Jackson says the moose was calm and didn't fight them. He said it was as if she knew they were there to save her. The two men came up with another rescue plan while Jackson talked to the animal. "It's OK honey, we will get you out of here. Trying to baby talk her to keep her calm as best as I could. Throughout the ordeal she was a very calm moose. I just talked to her the whole time." The two rescuers got another strap and managed to put it around the hoof of the moose, hooking it to the snowmobile. Jackson pulled on the strap as Nolan gently went ahead with the vehicle. "It took us five tries because we had to give her a break. It was really tough. What happened is she got both her legs up on the ice. The last couple of tugs, she finally just came up on the ice. We were able to get that one strap off her hoof," said Jackson. He wasn't prepared for what happened next. "She got up, looked us straight in the eye. I don't know. It's almost as if she was thankful. Like she appreciated what we did. It's weird to stay. It's a feeling we both felt. She kind of stood there for a bit, got a bit to eat. Chilled there for five minutes and trotted off and that was that," he said. Jackson said he and Nolan — who turned out to be a conservation officer — suspect the moose was being chased by a pack of wolves. While they didn't hear them, they did find wolf tracks. 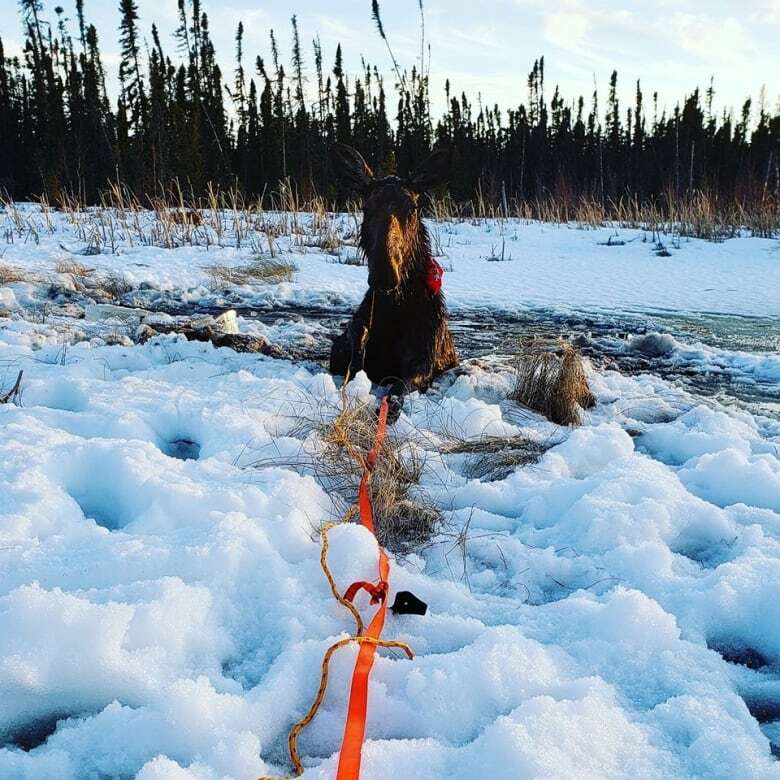 He figures the moose panicked, went to the mouth of the creek, fell in and broke the ice along the creek for about 200 metres. "For all we know, the wolves could have been in the tree line watching everything that was going down waiting for her to come back. But I do know she wasn't injured. There was no visible signs of injury. But I don't think she would have lasted much longer, because she was shaking and hypothermic." Jackson was relieved to know they gave the moose, which he suspected was pregnant, a fighting chance. He says the experience has changed him. He doesn't know if he will ever hunt for moose again. "I have hunted moose all the time. But this scenario and perspective has given me a different view. It's hard to explain. It's a good feeling, a really good feeling. We saved her and there was no better feeling than that. To get her out from that situation from as bad as it was, to have a happy ending liked that. It was awesome." As much as he loves eating moose meat, Jackson can't say if he will be able to eat it again. "Definitely that one hit home with me. Locking eyes on her and being so close to her. It changed my perspective for sure."